Need more information about booking Home 7277874 ? We are happy to introduce our house. For me the best part of the house is the space, the garden and the swinning pool. It is so nice in summer at night you can stay all night in the swiing poo having fun with your relatives and friends. As you can see in the pictures. It is spectacular, Expecially in summer-spring when all the trees are green and you can use the swiinng-pool. It is situated in small town near toledo. Yunclillos. A quite village where you can feel the natural envairoment and the silence. Yunclillos has everything. Shops. Restaurants. Cafe shops. Public Library, Public Swiing pool and a bus direct to Toledo. The popullation is around 1000 people. 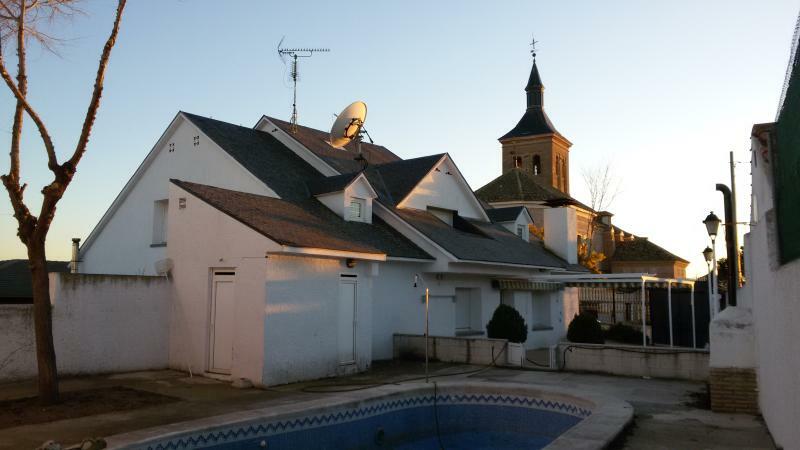 It is only 30m trip from the big City Madrid. and 10 Minutes way from Toledo. Thats made the house very intersting place to be when you want scape from the big city. There are few big shopping center near the house. You can visiti Toledo in the mornign and be all the evening relaxed in the swinng-pool. It is not allowed to parties or celebrations or placement annoying music that can disturb the neighbors. You can get in touch with Miguel Angel (the owner) through the contact form on this page. Send Miguel Angel (the owner) an email through the contact form on this page. Alternatively, if there’s a phone number on this page, you can call them. How do I contact Miguel Angel (the owner)? If you’ve already booked, go to Manage your holiday booking to view Miguel Angel the owner's contact details or send them a message. Or send Miguel Angel (the owner) an enquiry through the Contact the owner/manager form if you’d like a quote or more info first. When you pay online through the Book your stay form, a booking request is sent to Miguel Angel (the owner). You’ll find out within 24 hours whether they’ve accepted - no money will leave your account before then. You can also request a quote from Miguel Angel (the owner) through the contact form. The owner will email you the total cost for your dates and a link to book and pay online. Use the Book your stay form to pay provisionally online. You can pay by credit/debit card or PayPal. Miguel Angel (the owner) will have 24 hours to accept the booking and no money will leave your account before then. Why can't I call Miguel Angel (the owner) before booking? You’ll need to contact Miguel Angel (the owner) to do this. Send them a message in Manage your holiday booking or through the contact form on this page. You can request to change the dates or number of people on your booking via the Manage your holiday booking page. To change your holiday dates use the Edit booking button. If you need to change the number of guests staying then send Miguel Angel (the owner) a message. If Miguel Angel (the owner) agrees, they’ll send you a revised quote outlining the changes. You can review and accept/decline this from the Manage your holiday booking page. You’ll have 48 hours to take action before the revised quote expires.